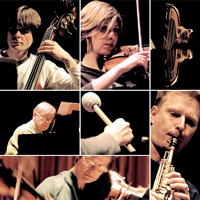 The London Sinfonietta is one of the world’s leading contemporary music ensembles. Formed in 1968, the commitment to making new music has seen the orchestra commission over 400 works and premiere many hundreds more. Our ethos today is to constantly experiment with the art form, working with the best composers and performers and collaborating with artists from alternative genres and disciplines. We are committed to challenging perceptions, provoking new possibilities and stretching our audiences’ imaginations, often working closely with them as creators, performers and curators of the events we stage. Resident at Southbank Centre and Artistic Associate at Kings Place, with a busy touring schedule across the UK and abroad, the London Sinfonietta’s core eighteen Principal Players, are some of the finest musicians in the world. Holding a leading position in education work, we believe that arts participation is transformational to individuals and communities, and that new music is relevant to all our lives. This belief is enacted through primary and secondary school concerts across the UK, interactive family events, and the annual London Sinfonietta Academy; an unparalleled opportunity for young performers and conductors to train with our Principal Players. The London Sinfonietta has also broken new ground by creating Steve Reich’s Clapping Music app for iPhone, iPad and iPod Touch, a participatory rhythm game that has been downloaded over 200,000 times worldwide.